In case you missed the latest news— the National Hockey League has a hard enough time getting people to pay attention when games are actually being played—Commissioner Gary Bettman went nuclear last week, filing a lawsuit against his own players. The suit was intended in part to affirm the legality of the NHL's ongoing lockout. We'll have to wait for a federal judge to rule on that. 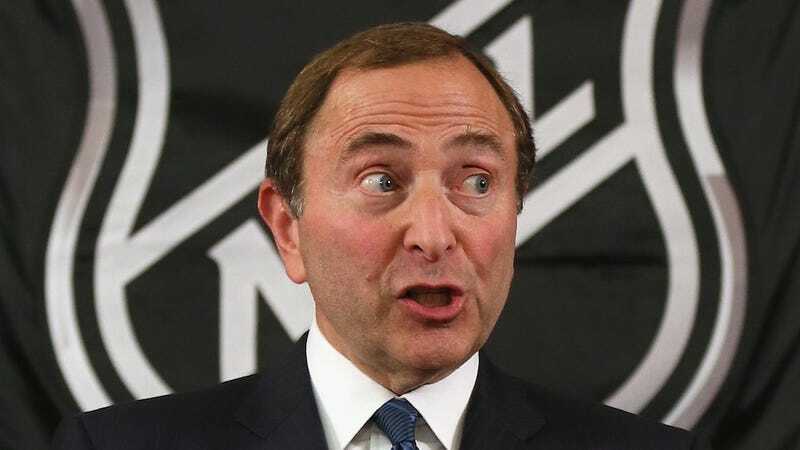 What we can safely say now, with his league about to lose its second full season in less than a decade, is that Bettman is the most inept commissioner in North American professional sports. Bettman wants to eliminate signing bonuses, cut the salary cap, increase time in the league required before free agency and set the maximum duration of contracts at five years. By one economist's estimate, these proposals would reduce the average player's wages by 15 percent to 20 percent. This get-tough approach was no doubt inspired by Bettman's mentor, the National Basketball Association Commissioner David Stern, who put a big dent in player compensation with last year's lockout and was never made to pay for betraying his fans: Even after shortening its regular season by 16 games, the league went on to set records for television viewership. The NHL, however, is not the NBA. It's a badly broken league, and much of the damage has been inflicted by its own commissioner. By pushing teams into unnatural markets—ice hockey doesn't belong in Phoenix any more than beach volleyball belongs in Winnipeg—Bettman created a huge financial gap between franchises that he's now trying to redress by taking money out of the players' pockets. Instead of viewing his job as the custodian of a sport with a long and proud tradition—the Stanley Cup has been around since the 19th century—and a deeply devoted fan base, Bettman is acting like the chief executive of a restaurant chain who can't stop looking for new markets to exploit, regardless of whether there's demand for his product. This hasn't worked for the NHL any better than it worked for Krispy Kreme. At least Krispy Kreme had an excuse: Publicly traded companies are under constant pressure to deliver increased revenues to satisfy impatient shareholders. As sacrilegious as it sounds, professional sports leagues don't have to keep growing to stay healthy. To be fair, hockey's obsession with expansion predates its current commissioner. In the early 1970s, when Bettman was still wobbling around Cornell University's Lynah Rink, the NHL was already trying to move beyond its primary markets in Canada, the Northeast and the Great Lakes. Between 1967 and 1991, when the San Jose Sharks joined the NHL, the league's "Original Six" (the teams in Boston, New York, Detroit, Chicago, Montreal and Toronto) had become 21. Existing teams loved expansion, mostly because each new franchise had to pay a substantial fee to join the league. And for a while, it didn't seem like such a crazy business strategy. The hockey zealots who ran the NHL back then were convinced that once people in places like Los Angeles and Atlanta were exposed to the game, they too would fall in love. There was also a precedent for a regional sport going national: The NBA started out with franchises in, among other cities, Rochester, New York, and Fort Wayne, Indiana. By the time Bettman took over the NHL in 1993, though, it was clear that America's appetite for hockey was limited, and that the league was never going to see the kind of national TV deals that had transformed basketball in the 1970s and '80s. Yet Bettman doubled down on expansion, adding nine more teams in such hockey bastions as Tampa, Florida; Nashville, Tennessee; and Phoenix. Bettman has stubbornly refused to give up on his own bad ideas, even when serendipitously presented with viable exit strategies. In 2009, the NHL paid $140 million to buy the league's biggest sinkhole, the Phoenix Coyotes, out of bankruptcy—in order to prevent Research In Motion co-founder and former Chairman Jim Balsillie from acquiring the team and moving it to a legitimate hockey town in southern Ontario. The NHL is now made up of a handful of profitable teams and a whole lot of money pits in cities that didn't care much about hockey to begin with and are going to care even less about it when the league eventually emerges from the current lockout. Not only do these expansion teams make it impossible for the NHL to find firm financial footing, they are often a drain on taxpayers, who subsidized the construction of their now-empty arenas and continue to service their debt. What's more, like Hanna-Barbera's second- and third-rate TV superheroes, they make a mockery of the league's historic rivalries. So what can the NHL do? Well, it could force its successful franchises to share a larger percentage of their revenues, which are derived largely from ticket sales and local broadcast contracts. This will never happen. And even if it did, it wouldn't address the root of the problem, which is pretty simple: There are hockey towns, and there's everyplace else. I realize this suggestion runs counter to every instinct Bettman has had during his almost-20-year tenure as commissioner. That may be the best thing it has to recommend it.